This model runs pretty true to Sidi’s size conversion chart. Visit our Sidi Sizing Information page for complete size conversion info (ladies can use the chart at the bottom of the page). The Canyon was a best seller for us in early 2006 when it was introduced. And now the style is even better with Gore-Tex as the waterproof/breathable liner used. Gore-Tex is used as the waterproofing material in everything from gloves to ski parkas. Its amazing properties keep water out while allowing moisture to escape, so the Canyon should work well for those that find themselves in all types of weather conditions. 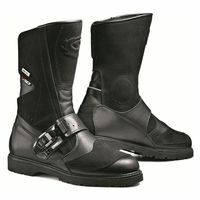 The overall boot design is aimed at riders who participate in everything from street/sport to dual sport. With the taller top and Velcro closure the boots would be worn with pants tucked in or out, and the boot’s styling will be fine for casual wear off the bike too. The boot offers features for the motorcyclist such as a heavy duty lug sole, shin protection, double leather in the toe/shifter area and reflective material which can be seen from behind. The boots have a “heavy duty” look somewhat like an off-road boot. Unlike an off-road boot though, they are comfortable! Take the “View Larger Pictures” link above to see some good close-up photos. Note the picture of the ratchet mechanism to tighten/loosen the instep. It took Jon and I about 10 minutes of fiddling with it to figure out how it works, but after we figured it out, it’s one of those things you slap your head and say Duh!